There are many ways to increase the beauty and value of a home, and one popular choice is to install hardwood floors in one or more rooms. These floors can be a fine fit for almost any room of your home. 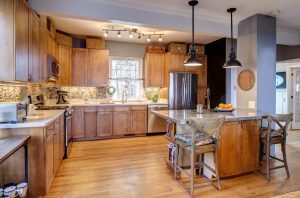 However, before you invest in hardwood floor installation, there are a few factors you may want to consider first to avoid wasting time and money. One important point to think about regarding installing hardwood floors is which rooms you plan to renovate. Hardwood can look beautiful in your bedrooms, dining room or living room, but may wear faster in high-traffic areas. While hardwood floors can be re-finished if they become worn, considering location is key if you want them to last. The hardness of the wood you choose can affect how your floors are installed. The Janka Hardness Scale, which measures the toughness of different types of wood, can help you understand which species of wood best suits your home’s needs. For example, if you have children and pets your floors will take a considerable amount of punishment, then you might want a wood higher on the scale. However, this might affect the price of hardwood floor installation, as the tougher the wood, the more difficult it might be to work with. Having your floors installed by a company who specializes in working with hardwood can help ensure the job is done correctly, so doing some research before you have the work done is something you should consider. Any company you choose should offer you an estimate, have sample photos of homes they have worked on in the past and be able to discuss their installation process with an honest and straightforward attitude. Hardwood floors can add class and elegance to your home. Before you invest in hardwood floor installation, however, researching different companies and considering your family’s lifestyle can help you make the most informed purchasing decision.